Norway’s Blood Red Throne have been plagued by lineup changes over the last few years, and the quality of their latest albums has suffered as a result. 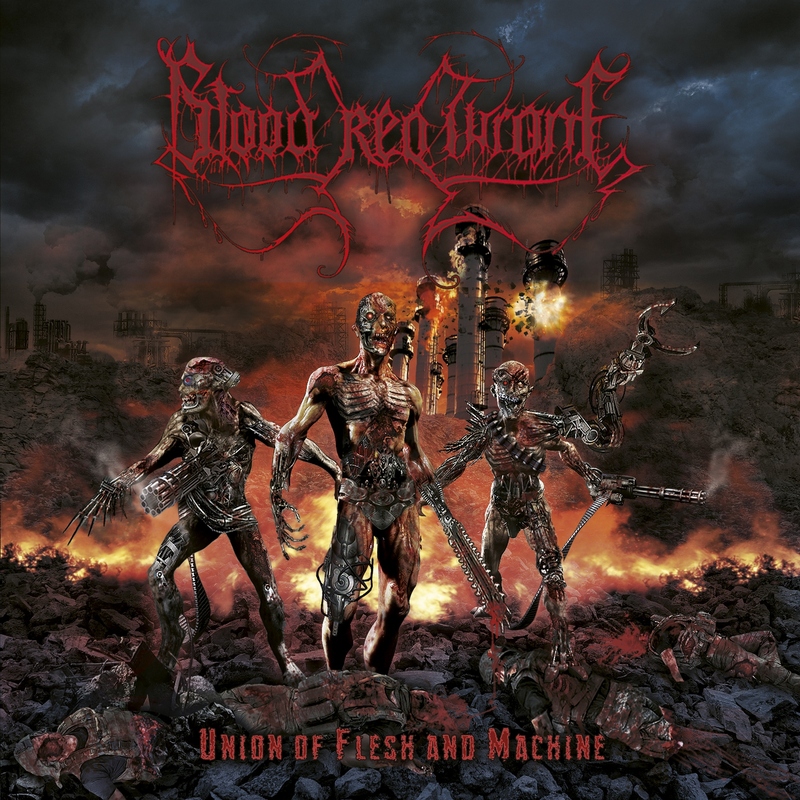 Originally starting out as a brutal death metal side project by Norwegian scene fixtures Tchort and Død back in the late 1990s, Blood Red Throne have released a steady stream of never groundbreaking, but always solid albums over the years. However, they seemed to peter out after Tchort left the band after the release of Souls Of Damnation in 2009. A revolving door of band members ensued, resulting in the release of mediocre albums that, more or less, culminated with a self titled effort (featuring the silliest depiction of a chair on an album cover that I’ve ever seen) in 2013. With that album, I had sort of given up on Blood Red Throne. For those of you that might have given up as well, you might want to take a look at Union Of Flesh And Machine. More minor lineup changes have occurred with original drummer Freddy Bolsø rejoining the band (he had left in 2002), but now, a steady lineup seems to have crystallized around longtime guitarist Død. Flesh And Machine is just simply better written and performed. The riffing is tight, the percussion punches you in the face, and the vocals from Yngve “Bolt” Christiansen perfectly complement the music. Sure, this is meat and potatoes death metal almost by definition, but it’s very well done with some really catchy songs. Album standouts include “Matyrized,” the title track and “Mary Whispers Of Death” with a steady deluge of riffs, gruff vocal from Christiansen with the occasional shriek tossed in, and a tempo that shifts back and forth between gallops and blastbeats. Although Union Of Flesh And Machine is not original, it’s sure to get your head banging. And that’s really the point of Blood Red Throne: get your head banging along to some solidly delivered, no frills death metal. Agreed to the entirety of the review My faves are Exposed Mutation and Primal Recoil.